MANHATTAN — Service resumed on Metro-North late Wednesday afternoon following a mid-morning gas explosion that leveled two buildings and killed two women, littering debris on a nearby Metro-North track. Trains began running along Metro-North's Harlem and New Haven lines just before 4 p.m., and service resumed on the Hudson line about 4:45 p.m., the MTA said. 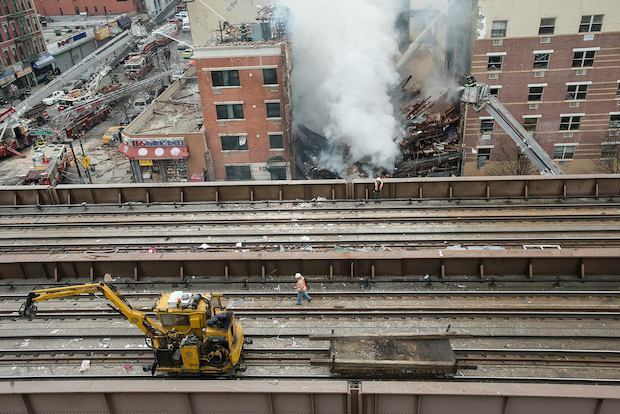 Workers had to clear debris from the four tracks running past the explosion site at Park Avenue and East 116th Street. The tracks were declared safe after being inspected by Metro-North and the FDNY. Trains were running at slower speeds Wednesday evening, causing some delays during rush hour, the MTA said. "Trains will run at reduced speeds through the collapse zone to protect nearby employees and reduce vibrations as rescue and recovery work continues," the MTA said in a press release. Earlier in the day, the MTA had routed stranded travelers to stations in The Bronx.